I’m going to go out on a limb and assume that most of you have a flash drive. If you don’t, or don’t know what one is, then this question isn’t for you. Ideally, how much space do you really need on your drive? While bigger is always better, do you really need to carry around 7GB of movie clips, and your entire music collection? Well, if you answered yes, then you’ll want to keep your eye on Buffalo. Most flash drives you see are anywhere from 1GB to 4GB in size. Sure, they do come in larger sizes, but your price/value sweet spot is generally right in that area. The largest I’ve seen that isn’t an actual SSD drive would be 32GB. 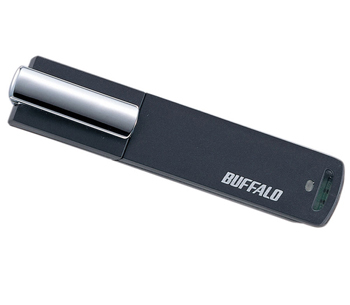 While Buffalo isn’t going to wow you with anything larger, their new 32GB drive does promise to transfer your files 20% faster than any other drive on the market by utilizing their TurboUSB technology. When you’re transferring large amounts of data, any extra boost in speed is very well appreciated. Unfortunately, there isn’t a lot of information currently available on this drive. I would imagine that Buffalo will be announcing pricing and availability during CES next month.